DAZE a brand-new original Masonry blog concept, crafted with innovative WordPress bloggers in mind who want to leave a strong visual impression on their target audience. With our new Special boxes feature DAZE lets you kill the the sidebar but still show the most important widgets (Most Popular posts, Latest posts, Social Links and Advertising banners throughout your posts. Choose which Special box is shown and how often it’s repeated. This way, especially when endless scroll is turned on, your audience will be reminded to discover more of your posts and content or connect with you on Facebook, Instagram, Pinterest or Twitter without the need for a sidebar. Make you blog even more impressive visually – DAZE WordPress blog theme comes with an integrated support for Animated GIFs. No need for plugins – simply upload an Animated GIF as your featured image and the animation will be shown on your post page as well as on all you post lists. Bored with Classic WordPress Pages? Use Pop-Out Pages! 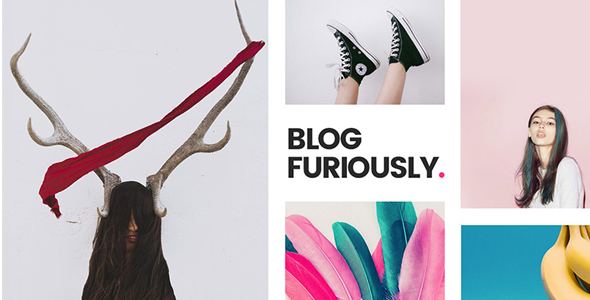 We have developed a new feature frequently used on trendy minimalist blogs – Pop-out pages and advertising banners. If you want to add more dynamic to your About or Contact pages and make them look more original – simply build an eye-catchy Pop-out pages and optionally add Animated GIFs to them. They can also be used to show advertising banners that load before the visitors see your homepage. This comes in handy if you want to promote advertising or your own content or social links. DAZE blog with a huge embed support: Facebook, Twitter, Instagram, Vine, Tumblr, Imgur, Youtube, Vimeo, SoundCloud, Mixcloud, TED Talk, Kickstarter, Scribd, Spotify, ReverbNation, Flickr, Hulu, Funny or Die, College Humor and many more. DAZE comes with a new fullscreen mobile menu that maximizes user experience and shows all menus, sub-menus, social links and copyright information in a clear way. Try it on your smartphone or tablet. Make it easy for your visitors to tweet your posts by using our integrated ?Tweet with selection? tool. Simply by selecting any text within a post (just like copying) visitors will be given a pop-up button that let?s them login to Twitter and immediatelly tweet the article with the selected text and a link to your post. Follow the latest color trends – we have selected 6 of our favorite color shades from this year’s PANTONE color reports. Choose from our own DAZE Punch or PANTONE’s Iced Coffee, Lilac Gray, Snorkel Blue, Serenity or Lush Meadow. If none of these suit you, customize your main color to your heart’s desire. Control you Blog Post Sliders – DAZE WP theme comes with two integrated post sliders. If you prefer Classic looking homepages, choose the Simple slider that shows one post per slide. If you want your visitors to view more posts faster, choose our 3 Post-Per-Slide Slider. We have created a detailed documentation so setting up your blog and controlling all aspects of the theme is quick and easy to find. With one purchase of any of our themes you receive 6 months of free support. If you have a problem just let us know at our Ticksy forum and we will answer ASAP. - Modified: Font icons replaced by SVGs; ‘Elegant icons’, ‘Linea basic’ and ‘Linea arrows’ fonts sets excluded. - Modified: Daze tagloud ( widget and also on single posts ) order by count instead of alphabetic order. - Bug fixed: Top post slider displaying post thumbnails in wrong ratio in some cases. - Option to add up to 5 advertising banners. - Options for different layout types for Tag, Date, Category and Author lists. - New Tiny Post list added for archive pages. - Single post on/off global options for category, author, date, dropcaps, enlarge media. - Minor WordPress date format bug resolved. - Minor Facebook widget bug resolved. - Minor Safari bug resolved. - Added options for views, comments count and date turn on/off in Top Posts Special Box and Top Posts sidebar widget.